You are currently browsing the tag archive for the ‘Council meeting’ tag. 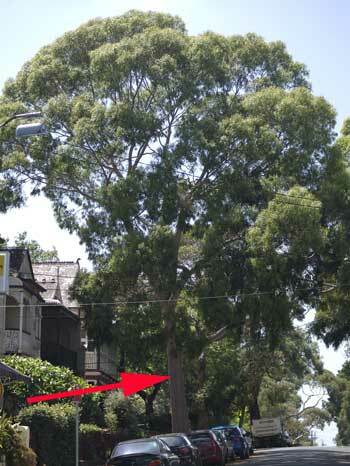 The Cambridge Street Stanmore Lemon Scented Gum tree is going to be chopped down soon. I feel very sad about this. During the Council meeting to decide the fate of this tree, the people who wanted this tree removed spoke about a large branch that fell on the street needing 2 people to carry it away. The danger the tree posed from falling branches would have been one of the major factors why their request was granted. 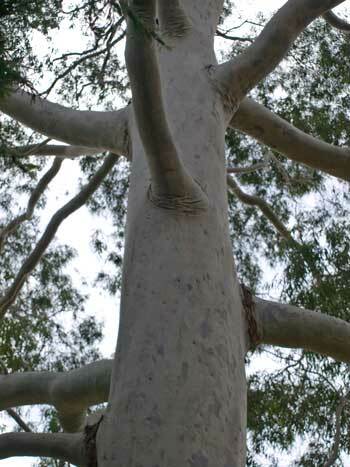 Gums trees do drop dead branches as a normal feature of their species. 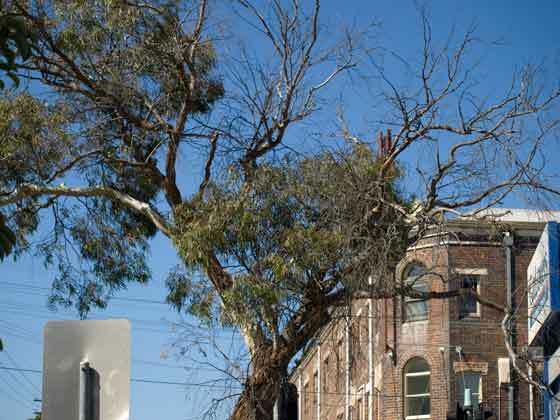 Unfortunately, I think this is the reason why Marrickville Council appears not to not regard Eucalypts favourably. Then include the fact that they grow tall & have a significant canopy. 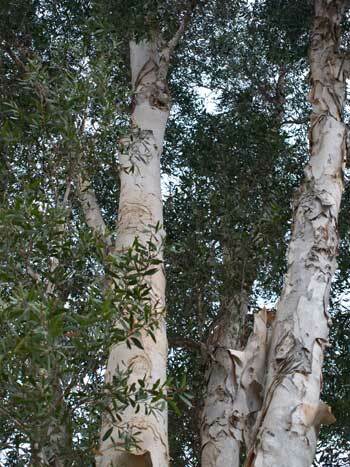 In comparison to the usual street trees Council plants, Eucalypts are an anomaly. I would guess the Gums are left over from the 1970s & before. 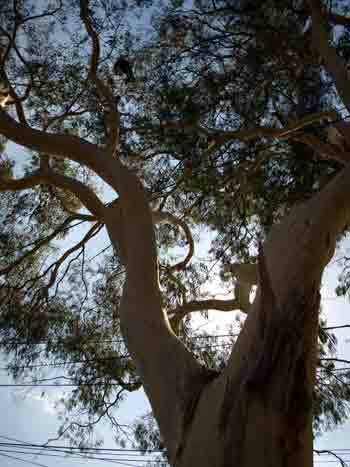 Suburbs like Petersham which have a lot of Eucalypts as street trees look fabulous as a result. Everyone I have spoken to in this area always mentions the trees, most saying they were a major reason why they chose to buy in Petersham. However, the Cambridge Street issue is likely to repeat itself for two reasons unless these are managed. Firstly, building movement that causes cracking. The Inner West is mostly clay soils & when there is drought (we have had a long one which is still continuing) the clay soils shrink. This results in movement of buildings & cracks to the walls, porches & paths, especially as most of the housing is 100 years old & the mortar used then was of very poor quality. Roots of mature trees would have stopped growing years, perhaps decades ago. Often the tree has nothing to do with movement. Arborists constantly have differing opinions about the impact of tree roots on house foundations. Personally, I think it is too easy to blame the tree. Even buildings that do not have a street tree out front can suffer from movement & cracking, especially during drought. If your property is built on clay soil, removing most or all the trees on or around your property is unlikely to prevent further house movement. It is a fact of life in the Inner West. Managing dry clay soils does take time & patience. The tree branch is dying over many months, sometimes years. The wife asks the husband to do something about it. Time moves on. She nags & nags, but he watches footy & says he will prune the branch later. Then, one day when he is mowing or something, the dirty big branch falls on his head & the wife is left a widow. The moral of the story is that men should do what their wife asks when she asks it to be done, husbands are lazy & her nagging is warranted. Maybe you had to be there & times have changed. The story made a big impact on me because ever since I have a keen eye to notice these branches. Whether or not Council should be responsible for checking trees for dying branches is not something I have an opinion about. However, I do think we see the street trees in our neighbourhood almost daily & if we notice a tree branch is dying, a quick call or e-mail to Council should have the branch pruned before it becomes a problem & drops. 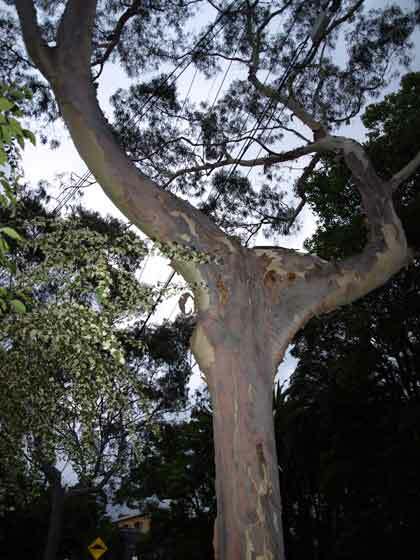 If we leave it until the branch drops, Council is likely to say the tree is dangerous & needs to be removed. Then the community suffers another loss of a tree & eventually we lose all remaining Eucalypts & other tall trees. Our suburbs suffer as a result because we lose the beauty that tall trees offer. We also lose out on property values because great street trees have a surprising positive impact on local property values. The street trees near our homes, especially the large ones, remove pollution & particulate matter which causes breathing problems. They collect CO2 & emit oxygen making the air cleaner & cooler. They lower temperature which helps lower our power bills, they slow down traffic, make the footpaths safer for pedestrians & generally make people feel happier. I have written more about the value of trees in the page 100 Tree Facts, which can be located on the left hand column of this site near the top. 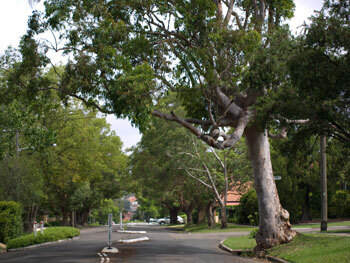 Lastly, if Sydney’s North Shore can have hundreds of thousands of Eucalypts as street trees, why can’t Marrickville LGA? Let’s look after & keep the ones we have left. They are necessary for our wildlife.